Redistricting is the process of drawing boundaries for electoral and political districts in the U.S. and is usually done every ten years after the census. The next U.S. census will take place in 2020 and all states must adjust their voting districts to align with changes in population. The U.S. Constitution requires each Representative in Congress represent an equal number of citizens and mandates a census to determine the number of citizens and apportion seats to each state. The U.S. Constitution (in Article I, Section 2) requires that Representatives be apportioned among the several states according to their respective numbers and specifies that there be at least one Representative for every 30,000 citizens (and each state must have at least one Representative). Every ten years, the Census Bureau conducts a nationwide census and informs each state how many seats it will have in the U.S. House of Representatives for the next decade. Individual states have the responsibility of drawing legislative boundaries for congressional districts as well as for state legislative districts. In most states, the state legislature redistricts seats, usually subject to concurrence by the state governor. 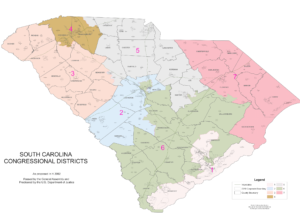 A few conduct redistricting through an independent or bipartisan commission in order to minimize the impact of partisan or legislative politics. A handful allow an independent commission to propose redistricting plans subject to approval by the state legislature. Each state maintains standards for creating electoral districts. Beyond equalizing the population of districts and complying with other federal requirements, criteria may include creating compact, contiguous districts; keeping political units and communities within a single district; and avoiding the drawing of boundaries for purposes of partisan advantage or incumbent protection. South Carolinians fact critical decisions before the task of redistricting can be undertaken. The League of Women Voters has discussed the issue of who draws legislative district boundaries during the redistricting process. Do voters choose their representatives, or do representatives choose their voters? The criteria for drawing boundaries may be an even more important issue than who draws those boundaries in answering this question in favor of voters. The League recommends an independent or bipartisan commission. Court cases over the years have established more specific guidelines for how these universal requirements are implemented. Within those boundaries, each house of the SC General Assembly has created its own specific criteria. In 2011 the South Carolina Senate issued its criteria and the House also issued criteria. The House criteria of 2011, interestingly, include “Incumbent Protection” as a specific requirement. The House and the Senate do not need to adopt the same criteria. The South Carolina Women’s Leadership Network is a 501C3 non-profit corporation.